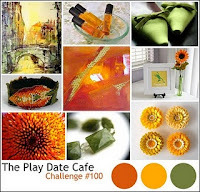 I made this card for the current Play Date Cafe Challenge #100. I wanted to use my new Hero Arts Fox, Sizzix hexagon die and Amy Tangerine stickers. So I made this simple scene - maybe a little too simple, but I like it. Thanks for taking a look! Love the intricate hexagon background and cute fox! Great take on the color combo, Donna! Another fab card! Love all that paper piecing, works perfectly on the kraft base! Donna, this is so creative! I love those hexagons the fox is sitting on, and oh, is he the cutest fox EVER in his paper pieced outfit! Thanks for playing along with us at The Play Date CAfe this week!